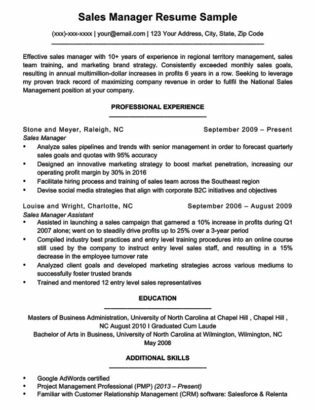 If you are in marketing or marketing management, this resume sample is perfect for you. Feel free to download, customize, and use however you’d like. Or, if you’re strapped for time, take our easy-to-use resume generator for a spin. Not the job you’re looking for? 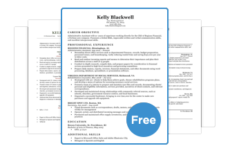 See our full list of resume samples here. Want a template instead? We have plenty of those too. Our sample is hardly the only way to compose a resume for marketers or marketing managers. For example, ours is a combination format, but there are different ways to format your resume as well. We also have some related documents, including cover letters, below. Ready to move on? Keep things pushing by checking out our expansive cover letter collection for some pointers on how to optimize yours. 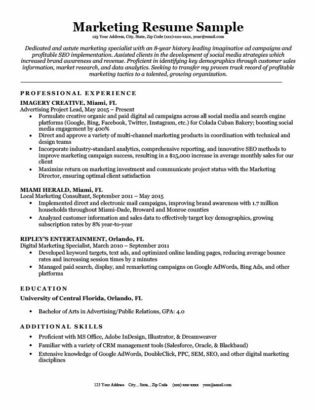 For management positions, including marketing, we recommend the combination format for your resume. However, if you are applying simply as a marketer, a chronological format is likely more appropriate. Especially if you are entry-level in the field. The more experience you have, the more you’ll want to emphasize specific accolades or skills versus simple experience. Management often implies years of experience over the type of job you’re managing. The more experience you have, the more you’ll want to emphasize specific accolades or skills versus simple experience. Perhaps the most important skill you need as a marketer is communication ability. Specifically, we mean a capacity for writing concise, clear copy. Make sure you showcase writing skills on your resume. Do this by including any publications you’ve been published in and showing experience. Also be sure your resume has absolutely no mistakes. Many marketers have a great eye for design. This makes sense – much of marketing a product involves catching the eye of the customer, and good design is a surefire way to make sure yours sticks out from the rest. If you have any design experience, including web, art, product, or digital, be sure to include it prominently on your resume. If you’re applying for a marketing manager position, you will need to possess strong leadership skills. As you’ll be in charge of a team of marketers, run-of-the-mill responsibilities might no longer be under your purview. As such, make sure you clearly highlight you capacity to motivate a team. Being able to understand why people think like they do is critically important to strong salesmanship. The best marketers often have a background in psychology. Being able to understand why people think like they do is critically important to strong salesmanship. If you studied psychology or even have taken a class, list it under education or your skills section. As a marketing manager, be sure to focus heavily on leadership and accolades, especially any related to previous management experience. If you are applying to a management position for your first time, emphasize projects where you played a leading role. This will bolster your management credentials. If you have years in the field, be sure to focus on accolades and awards if you have them. If you are only a few years into your marketing career, however, follow a chronological format and emphasize your experience. Remember, if something seems off, don’t be afraid to disregard a few of our rules. Your resume needs to be perfect for you. Make the decisions that are right for your particular circumstances. Beginning your resume with a strong career objective section can really grab the attention of the hiring manager and make you stand out relative to other applicants. Find out how to write a compelling career objective here.